We have a large windowless meeting room at Argonne with an old-fashioned pull-down projector screen. When I walked in there yesterday morning for the CERN videolink I was greeted by 30-odd ashen-faced physicists. Oh lord, I thought, there has been a terrible accident. The accident, it turns out, was comic sans. There stands Fabiola Gianotti, our queen, looking fabulous and doing a typically faultless job of presenting a complicated and not-yet-conclusive measurement; taking the work of hundreds of nutty, stressed-out physicists and breathing sense into it. Do we need to add an additional systematic uncertainty to all our measurements based on this unwise choice of font? Are any of our results still valid? What does this mean for the speed of light? 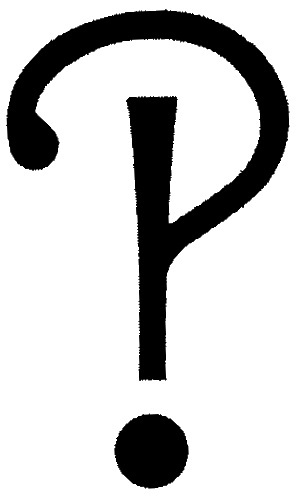 This interrobang is not in comic sans. Perhaps this says something about physicists. There is a sign on my door that says “Hell is other people”. It is in dark lavender, narrow Gill sans. Since putting this on my door I have had approximately 50% more pop-ins from colleagues. One of these was explicitly to congratulate me on the choice of font, which is, incidentally, a font designed by a man who apparently had quite serious `behavioral difficulties‘. Unlike our spokeswoman, who is clearly focused on content above style and is, coincidentally, the spokesperson of the largest particle physics experiment the world has ever seen, I am bordering on being beyond help in the content versus style wars. I can happily spend an hour or more of an evening just playing with different combinations of font and bullet point. Also, I almost never think about physics when sitting on the bus, staring out the window (the meditation pose of the modern woman). I bet Fabiola does. I am a particle physicist working on sonification of the data output from the ATLAS detector at CERN. The project I'm working on is called LHCsound and is funded by the STFC. It is based at University College London where I have just finished my PhD on the search prospects for a low mass standard model Higgs Boson. I have now moved to Chicago to start an ATLAS postdoc with Argonne National Laboratory. This entry was posted in Arts, Rambling and tagged LHC. Bookmark the permalink.